It was a little wet and rough today but we managed to scrap out a decent catch. 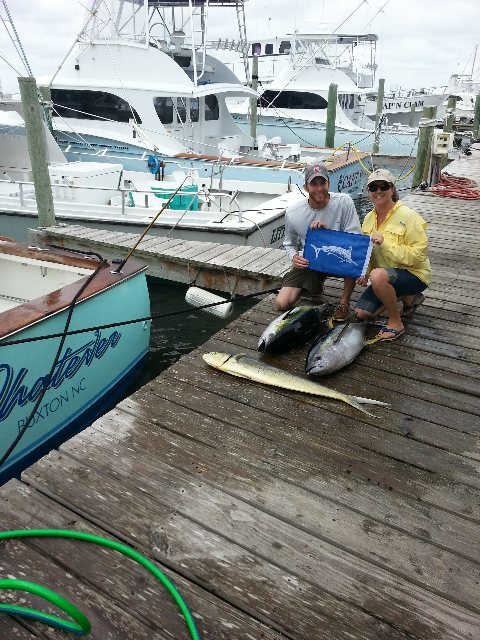 We caught 2 nice 40# yellowfin tunas a nice gaffer dolphin along with Joe's first White Marlin. We had one other Marlin encounter crashing a long rigger but never came tight. We didn't get a good enough look at it to tell if it was a small blue one or another white. We decided to call it a day a little early which turned out to be a great choice cause just after we backed into the slip the wind really breezed up. It was good to see a few Yellowfins around though hopefully they will stick around awhile.